Where can you buy an iPad, iPhone, or a MacBook in New York? There are many small shops that offer these products, but it is best to buy those products at an Apple Store. The prices do not differ very much from the small shops, but if you buy at an Apple Store you are ensuring that you will get quality equipment. 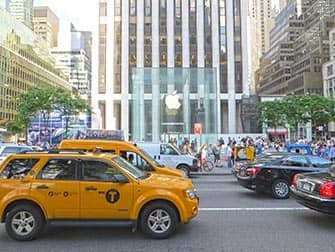 iPhones are not always available for sale for those living outside of the United States, because purchase is sometimes based on purchasing a contract. iPods, iPads, and MacBooks are easy to buy here. You can also buy the “Apple Care” (protection plan) since this is available to those living internationally. There are eight Apple Stores in Manhattan. The Flagship store can be found on 767 Fifth Avenue. 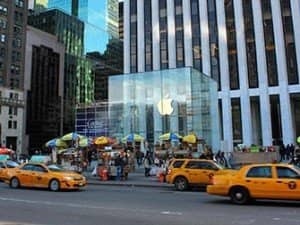 This famous Apple Store in New York, with its impressive glass entrance is momentarily under construction. It has been temporarily relocated to the building next door, the former FAO Schwarz toy shop. The biggest Apple Store is the branch in Meatpacking District, on 401 West 14th Street. Do you want to combine purchasing your new Apple gadget with shopping for other products? Then the shop-in-shop in Macy’s is just what you’re looking for. Here you can find Apple-products on the ground floor, between the perfume and cosmetics. Another Apple store that is great to visit during a shopping trip is the store in Westfield World Trade Center. The sleek Apple products fit in perfectly with the modern architecture of this shopping mall. 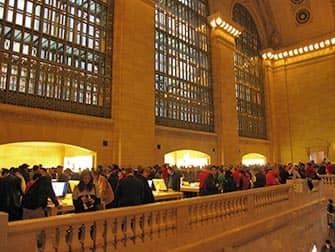 The branch with the most special location is undoubtedly the one in Grand Central Terminal. 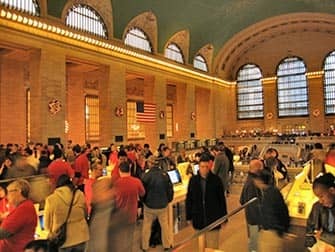 You can browse the iPhones, iPads and MacBooks with the world famous station as your backdrop. 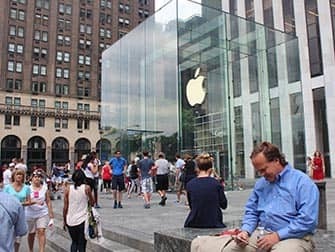 Along with the five aforementioned locations there are three further Apple Stores in Manhattan: Upper East Side, Upper West Side and SoHo. So for true Apple-fans, New York is a real paradise! Eric’s Tip: Remember that on top of the listed price of the item 8.875% VAT will be added at the till. So, an iPad with the price of $499 will actually cost $543.29. Apart from that, American products, of course have American plugs, chargers, etc. So, when buying products in the Apple Stores in New York, bear in mind that back home you will need to buy some AU compatible accessories.